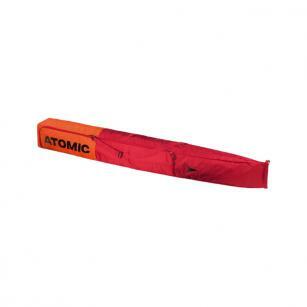 The Atomic Double Ski Bag is 205cm long and has room for two pairs of skis and poles, protecting them from damage with a water and stain-resistant outer fabric and an easy-clean Tarpaulin lining inside. It also features fixing straps inside, and our Ski Length Adjuster so you can adjust the length of the bag with a simple rolltop and hook. This means your skis are always neatly packed and never slide around, which is when damage can occur.